Printable Mother Teresa Inspiring Quotes! 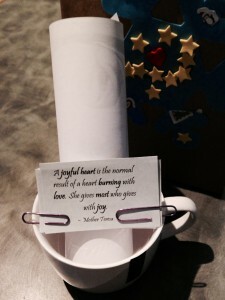 I will be attending a Advent Ladies Potluck this week, besides bringing a dish to share, we were each asked to bring a gift with an inspiring quote to exchange. At first I thought I would make a nice tea mug with quote but after not being able to find the right markers to make the mug, I came up with a new idea. Instead I created a sheet of quotes by Mother Teresa. 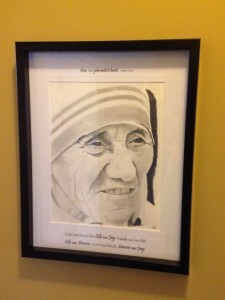 The sheet has 10 inspiring quotes by Mother Teresa and prints out on either business card paper or regular paper. I have included this Mother Teresa quotes page here for you to print as you like. 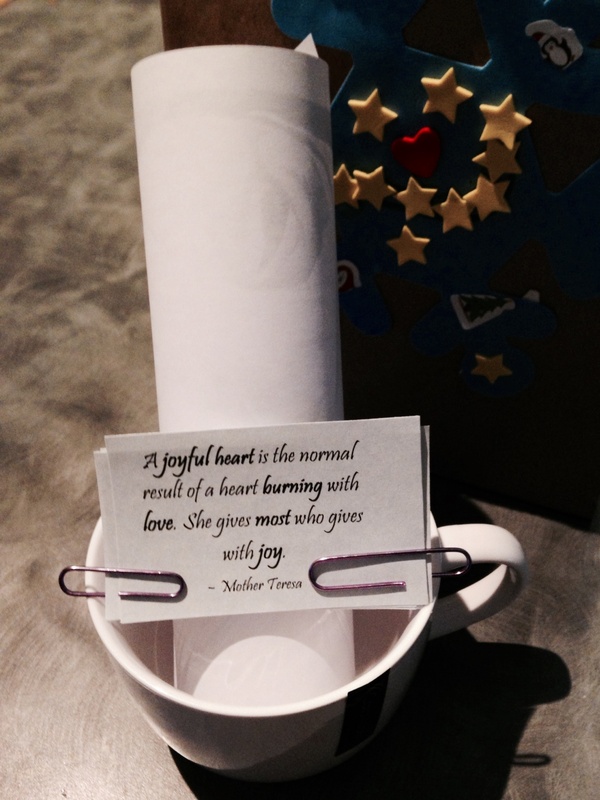 I placed these quotes in the mug as well as a picture of Mother Teresa with one of my favorite quotes. I hope you can enjoy these quotes too! I decided in that moment that I would choose to live my life in service to others during these dark days in my life. I would look for each blessing I had and I would find my Joy in the Lord. It was very fitting as we named our baby Joy Faustina and in the very difficult days that followed (I miscarried for over two months with many emergency room trips). I learnt that true Joy comes from the Lord – no matter what is happening you can always find Joy if you pray, trust, and rest in the Lord. The second important thing I learnt was that I had never given enough of myself to my community – to my friends in need – sure I might have offered help or brought a meal, but was that really all I could offer someone in a time of need. I learnt that to really love our neighbours you need to give, give till it hurts. Every small act of love or kindness some one did for my family during this time was such a blessing and it helped me carry on. But now that I know better when a friend is in need I will do all that I can – even if I am busy, tired, short on money or stressed – it matters not because their needs exceed my needs in that moment. As the body of Christ we are many parts and if we all work together in service to others and we help carry each others burdens with love – even the darkest times can be made lighter. Love in contagious, service shows our love, service truly brings joy and since God is love! Here is the image that now hangs on my wall as a reminder of our beautiful Joy and that is we really want to love we must give, give our ourselves, our resources, our time, our prayer – but GIVE and keep giving till it hurts in service and love on a daily basis! she is a true and living Mother of the poor.